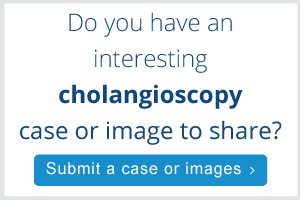 This web page provides clinical data, case studies, tips and techniques and disease management perspectives on digital cholangioscopy from physician experts in this field. Endoscopic Management of Hilar Cholangiocarcinoma, Clinical Evidence Overview and Case Review Video Presentation, Michel Kahaleh, M.D. Accuracy and cost effectiveness in stricture diagnostics, and a multidisciplinary approach to palliative treatment for non-resectable disease, including stenting, RFA, and mapping with cholangioscopy. Neil Sharma, MD, gives an overview of Cholangiocarcinoma and how it is the 2nd most common primary liver malignancy. Role of Cholangioscopy in Managing Patients with Liver Disease and Transplantation, Presented by Roshan Shrestha, M.D. and Marwan Kazimi, M.D., Atlanta, Georgia, U.S.A.
Dr. Shrestha and Dr. Kazimi share their institution’s multi-disciplinary approach to managing patients with liver disease. They also discuss the role that direct visualization and targeted biopsies play in managing these patients. Dr. Ellrichmann presents his experience diagnosing and treating complex bile duct stones, and shares case studies and data related to cholangioscopy with lithotripsy. Using the SpyGlass™ Retrieval Snare to Remove a Migrated Stent by Robert D. Fanelli, M.D., Sayre, Pennsylvania, U.S.A.
After numerous attempts are made to remove a migrated stent in the CBD with various devices, the SpyGlass™ Retrieval Snare is utilized to snare the stent and successfully remove it. In this case, the SpyGlass DS System is used to facilitate advanced detection and appropriate staging. A 55-year-old patient underwent ERCP using cholangioscopy for removal of a difficult stone and a previously impacted basket. A 70-year-old patient is evaluated for intraductal papillary mucinous neoplasms (IPMN) using cholangioscopy revealing a villous mass extending from the tail of the pancreas to the proximal head. Step-by-step instructions for the removal and disposal of the SpyScope DS Catheter after a cholangioscopy procedure. This video tutorial provides step-by-step instructions for the setup and use of the SpyScope DS Catheter, including attaching the SpyScope to the controller, the duodenoscopy and the irrigation and aspiration. Want to learn more about the devices featured on this page? Removing a Cystic Duct Stone using the SpyGlass™ Retrieval Basket by Dr. Hussain, Dr. Gumustop, & Dr. Choma, Albany, New York, U.S.A. Using Direct Visualization and the new SpyGlass™ Retrieval Basket to Identify and Remove Multiple Pancreatic Duct Stones, by Dr. Kim, Flushing, New York, U.S.A.